The next World Convention will be . . . . 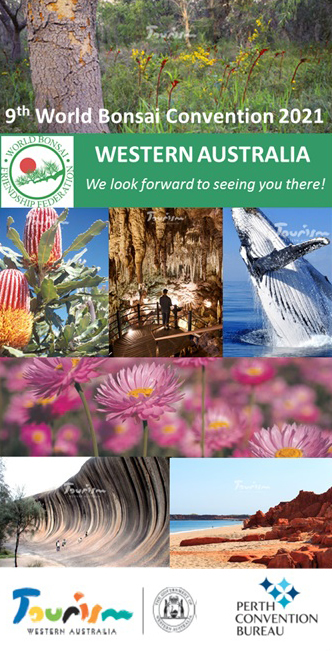 This logo represents Perth - Western Australia, hosting the 9th World Bonsai Convention. The connotation of a boomerang, depicted in a colourful silhouette, with warm earthy colours, reflects our sunburnt country. The light blue with yellow hues represents our beautiful beaches with clear turquoise waters. The beautiful rugged Melaleuca Bonsai with the rustic pot symbolizes our diverse range of Western Australian native trees. Copyright© WBFF Bonsai. All Rights Reserved.